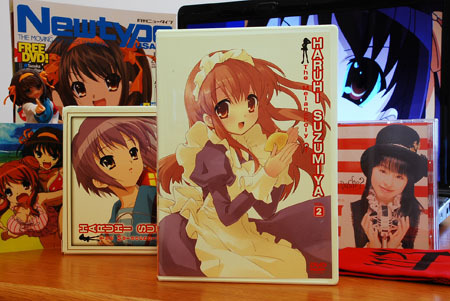 Haruhi Suzumiya Limited Edition DVD 2 with extras. Newtype and Max Factory Figure added in background. 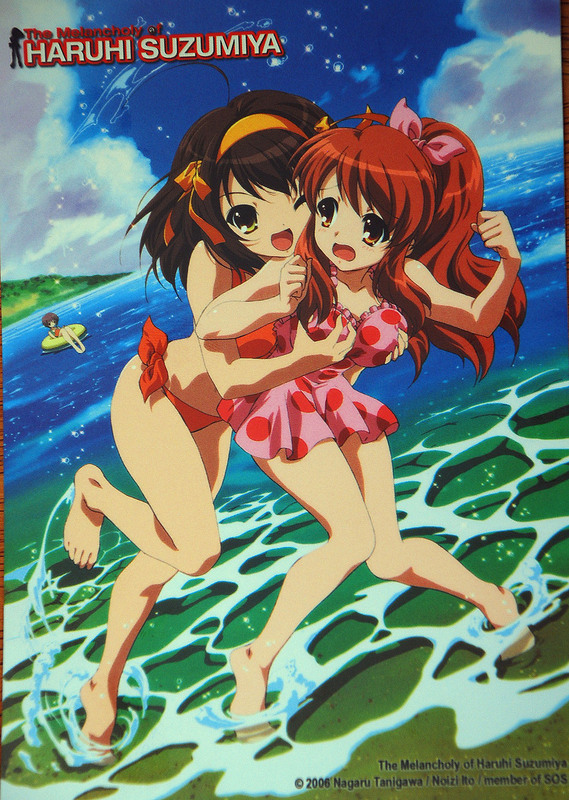 The day I get my Haruhi Suzumiya LE DVD, I happen on this. The pic is from the newest Japanese Newtype and says that an airdate for the season will be released this Saturday. I am eagerly waiting for this series to come back since I’ve been a fan since I watched the the 1st (or last) episode. 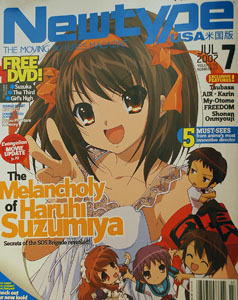 So with Haruhi news and merchandise on my desk, I decided to do a post full of Suzumiya and some little things about them. This sweet limited edition box comes with 9 episodes on 2 disks (MHS 4-6, Boredom of HS, and episodes 1-5 in broadcast order!) , a variant cover for the actual dvd case, an SOS armband, the cd single Bouken Desho Desho, and a double sided pencil board. I missed out on the 1st LE of Haruhi and thought Bandai would hold back on extras for their remaining releases. No Sir! Aside from some fantastic extras, the episodes on the two disks are pretty good. Since the 1st LE covered the episodes of the 2nd disk, I’m going to briefly look at the episodes on the 1st disk. I’ve always liked the 2 different sides of the series, from it’s comedic to it’s sci fi, and sometimes dark, episodes. For the majority of the episodes on the disk they deal with a more serious sci fi element with one episode being more relaxed and funnier moments than the previous three. The Melancholy of Haruhi Suzumiya in a nutshell is about a girl, Haruhi, bored with life and the clubs offered at her high school so she makes one, SOS Brigade, and gets members (sometimes abducts) in order to investigate the paranormal. Throughout the series she fails to get herself in these supernatural events, unfortunately Kyon the 1st to be picked for the club, finds himself in the middle of these strange events. 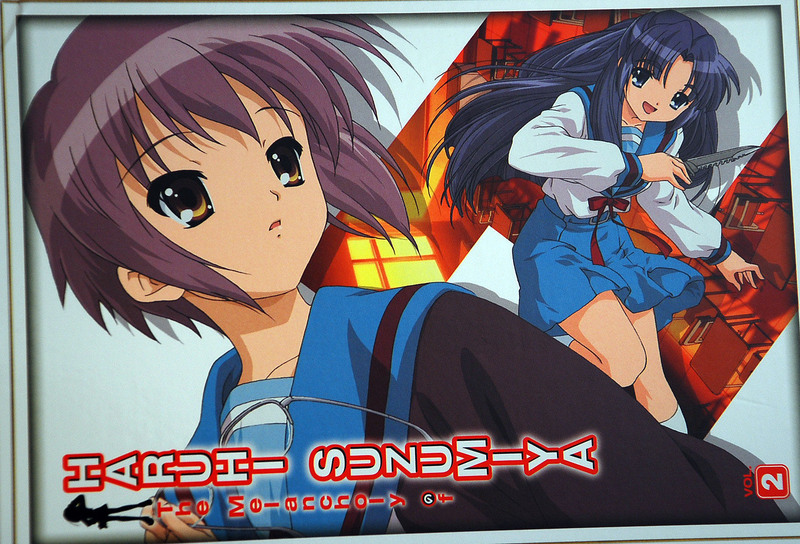 The 1st episode starts out with Kyon finding, pictures of Mikuru (the moe girl of the series and pictured on the box cover) on the club’s website in very revealing pictures. Haruhi has posted them there in order to get more visits and stir up excitement for the club. He begins to delete the pictures off the website, and when Haruhi’s not looking saves them for himself. Alas Kyon’s good fortune turns the other way when he gets a mysterious invitation and results in the most violent scene of the series. 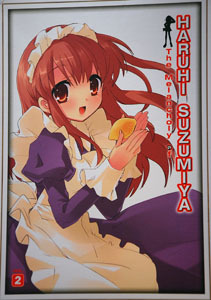 Future Mikuru. Haruhi flashback. Haruhi jealous? Many things and people reveal themselves to Kyon throughout these episodes. All of which escalate in the third episode on the disk which technically is the season finale of the series…yes you read right…season finale in the middle of the series. The coming together of the SOS brigade and all the strange events was not by coincidence as Kyon finds out and all revolve around Haruhi Suzumiya. Kyon and Haruhi at the end of the world? Although I prefer the funnier and zannier episodes to the straight out sci fi, these episodes were pretty good and interesting. It showed that there was a little more depth to all the characters with some background on all of them popping up. 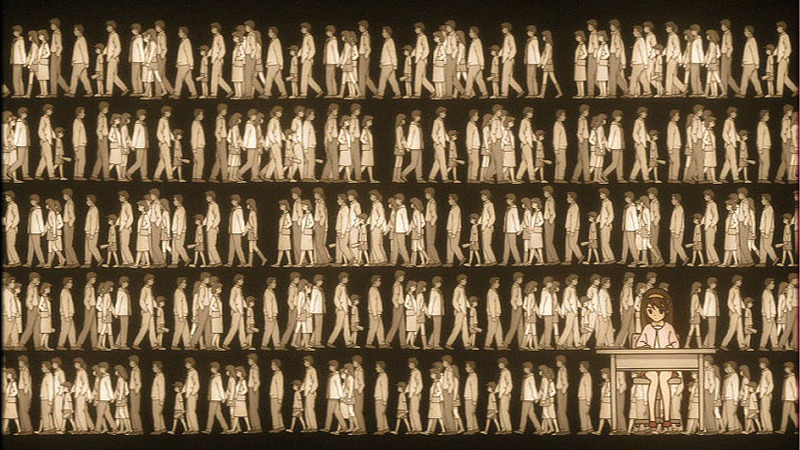 I had originally watched the episodes in broadcast order and it didn’t really bother me that some of them were mixed up on purpose to give the series a unique feeling. I don’t think it takes away from the series that the series finale is in the middle, since the episodes that follow tend to be funnier and less serious. Having said that my favorite episode is the last one, where Haruhi finds herself bored once again and gets everyone involved in a baseball tournament. Got this in the mail with the DVD as an added bonus. 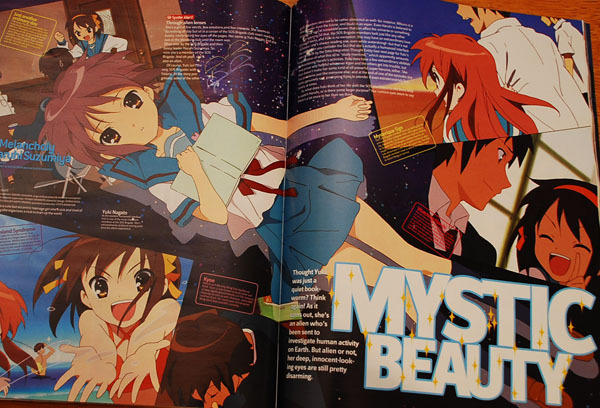 Lots of great pictures and information on Haruhi and the gang, with a few pages dedicated to Yuki Nagato. Got the figure above a few weeks ago but didn’t really take a good pic of it so there it is. A really nice figure with great details. 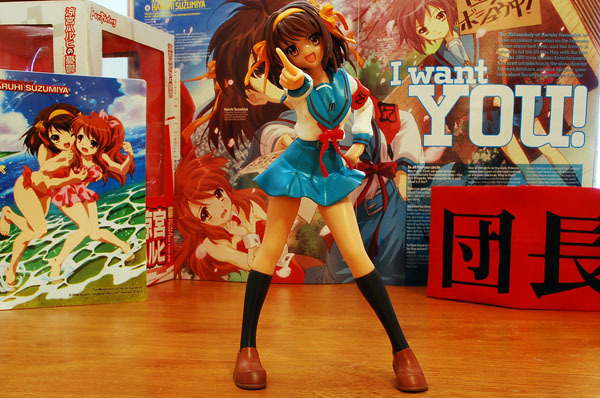 I haven’t purchased anything from Max Factory as of late, but I’m pretty impressed with what they did with Haruhi. The figure comes with a circular stand, another arm band for the figure, alternate hand that holds a bull horn, and removable skirt. In one of the episodes coming up, Haruhi actually commands a Gundam to deploy. 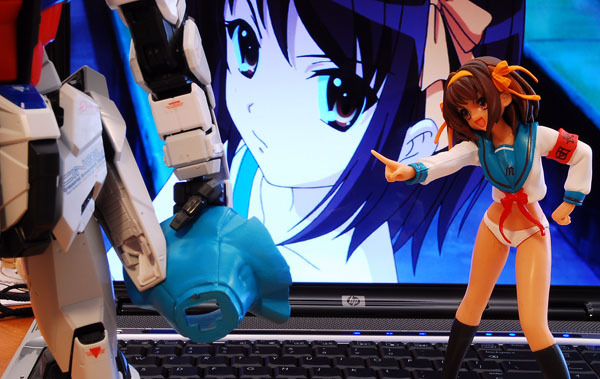 Although it’s not the Gundam above(a recent purchase), I found it pretty cool and funny that even Haruhi has access to a Gundam. Hmm, so we both got our LE Volume 2 DVDs at the same time (even though I live on the other side of the Pacific). All hail transoceanic airfreight! I’ve been burned so many times before by “official” second-season announcements I still can’t quite take this news in. Either way, we’ll know soon enough. It was inevitable that there was going to be another season, but I’m just as excited to hear an official announcement! That figure looks pretty cool. I looked it up and it’s pretty expensive! I might get it though, it looks like it’s worth it. Look at all the treasure! Haruhi’s a good show and she’s not bad on the eyes either. ooohh nice. i got the regular edition of the first dvd and i like the series so far. 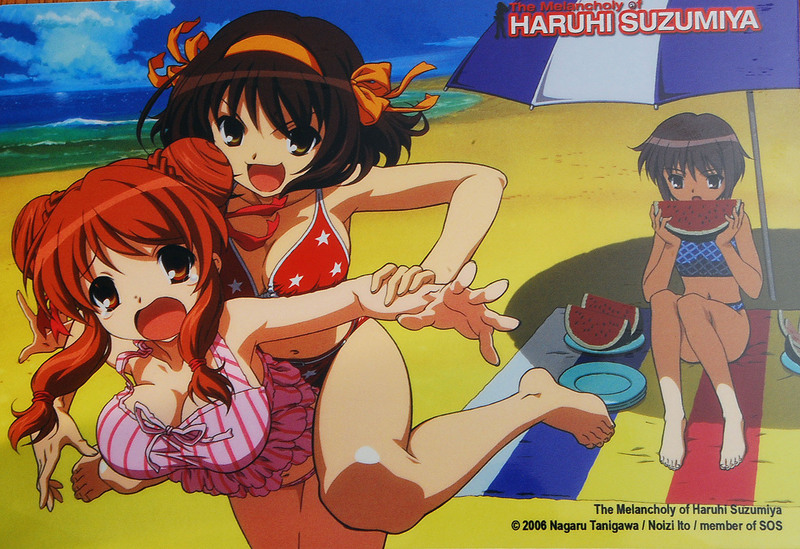 i like the last pic of haruhi ordering the gundam. is that a laser she’s firing from her bullhorn? @Diego=I hope it’s news regarding a 2nd season. At this point it’s still to early to tell, with different sites saying it is or it isn’t. From what I can tell, it is! @Kit=It’s expensive for a figure, but you get what you pay for. Very excellent! @Jana=Yeah that was unintensional. But I noticed that it looked that way so I moved the figure a bit to make it look so. 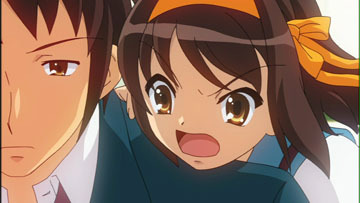 That’s one of my favorite moments in the Haruhi series. Where did you order the dvd from, if you don’t mind me asking? I got the DVD from Amazon.com using my prime membership. Haruhi is bossy. I don’t see how her friends can take it.